The 1951 Bowman baseball series is easily placed among the top collections ever produced, thanks mostly to the rookie card of Mickey Mantle and Willie Mays. The featured collection is just 13 cards short of a full set and doesn't have a Mantle or Mays but comes in at 20% NM or better, 35% EX/MT, 30% EX, 10% VG/EX and 5% lower. Seven cards are PSA graded: #1 Ford RC PSA 2.5, 2 Berra PSA 5, 30 Feller PSA 6, 31 Campanella PSA 6, 32 Snider PSA 7, 165 T. Williams PSA 7 and 232 Fox RC PSA 6. Other key cards are #3 Roberts EX, 7 Hodges EX/MT, 26 Rizzuto EX, 80 Geese VG, 181 Stengel EX, 186 Ashburn EX, 198 Irvin EX/MT, 254 Jensen EX/MT and 306 Piersall EX/MT (PD). 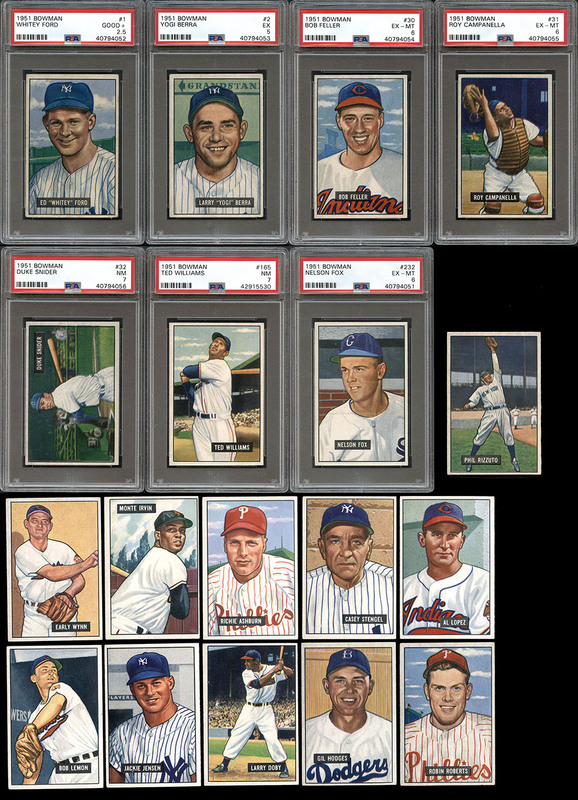 Needed for completion is #57, 87, 93, 101, 134 Spahn, 215, 253 Mantle, 263, 301, 303, 305 Mays, 317 and 319.